There are few universities in the world that have been able to transform the spirit of free thinking into an unstoppable cultural movement, assuming thereby the role of a guiding force for a people in times of acute national crisis. 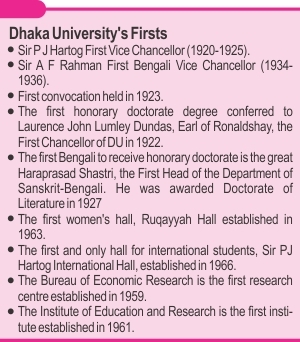 The University of Dhaka (DU) is one of those few that, besides sparking an inquisitive zeal among students, has intertwined its course with the emergence of a country and all her subsequent upheavals. It laid the foundation of Bengali nationalism in terms of common linguistic and cultural codes, which later paved the way for provincial autonomy leading to independence. It has, however, come a long way since its inception on July 1, 1921 with a considerable increase in students, new departments, faculties, and so on. But the glorious past of student politics has now fallen prey to a new brand of politics marked by the ominous clanking of deadly weapons and inevitable in-fighting over the business of tender. This alone blurs all its shining outlines, past and present. Besides a downslide of its performance in the world ranking of universities, the burgeoning crisis of dormitories has compounded students' sufferings. Be that as it may, on the occasion of its ninetieth founding anniversary, the biggest educational institute of the country deserves a look into its glorious past and adjusted present. A journey through its chequered history is somewhat indistinguishable from the history of Bangladesh itself. In order to get a picture of the academic as well as cultural ambience of DU before the partition, one only needs to read Buddhadev Bose's autobiographical Amar Joubon, especially the part devoted to 'Dhaka University: 1927 to 1931'. The number of students had not surpassed even 1,000 then. The discipline and orderliness mandated by the university was not much of an impediment to exploring different areas of the subjects along with personal development. The sparsely spread two-storey buildings and laboratories, all set in a horizontal location, were surrounded only by luscious greenery. The influence of the architecture in English countryside was evident in all the structures (the architecture of the Curzon Hall is still reminiscent of this), which was very consistent with the soothing serenity of the campus endowed with so many trees. While moving across the buildings, one would have met the introspective Satyendranath Bose passing by, then a professor and head of the Department of Physics, who had upheld the image of DU in the scientific world with his theory of Bose-Einstein Condensate; or Ramesh Chandra Majumdar for that matter, head of the Department of History and an acclaimed historian of the Indian cub-continent. To Bose's excellent account, one must add two more names, among many others; they are the great Haraprasad Shahstri who discovered and deciphered the Charyapada, the first instance of Bengali manuscripts from the ancient period; and Dr Mohammad Shahidullah, a remarkable linguist and pre-eminent scholar of Bengali literature. The one inconsistency that had thrown Buddhadev Bose off balance was the lifeless appearance of a handful of female students compounded with their stunning silence both inside and outside the class. They were always guarded by the teachers so that no male student could even talk to them. Professor Emeritus of DU Anisuzzaman, shares an all but similar experience with a slight change in context. 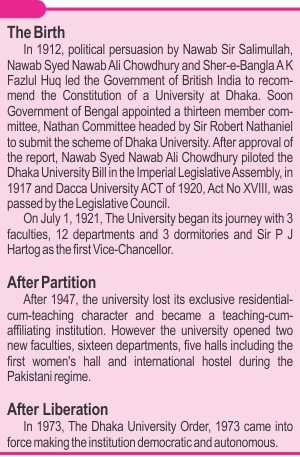 He enrolled in the Department of Bengali at DU in 1953. After finishing PhD, he joined there as a lecturer in 1959. When there were cultural functions, the same conditions prevailed but with the permission of the Proctor female students could come and perform for a very limited time while being under constant surveillance. Permission was required even for arranging literary or cultural gatherings. There was only one cultural organisation named Sangskriti Sangsad which arranged literary and cultural programmes. But the centre of all cultural activities was based in the dormitories. A hall-based student's union, elected by the students of the hall, regularly organised debate, literary, cultural and sporting competitions. 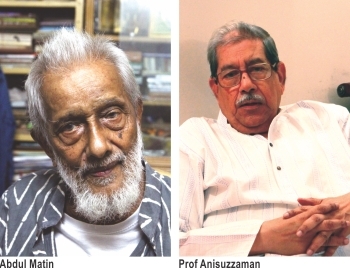 In the 50s, Anisuzzaman recollects, elections of central or hall-based unions were held regularly. “Because of hall-based cultural activities, bright students through their performance and organisational skills could easily draw attention and get elected in the next election,” he says. “More importantly, we tasted the collective hall life to the fullest, which naturally created a bond and a sense of solidarity amongst us,” he adds. In the 1960s and subsequent decades, more and more students enrolled and expanded the horizons of all sorts of activities. 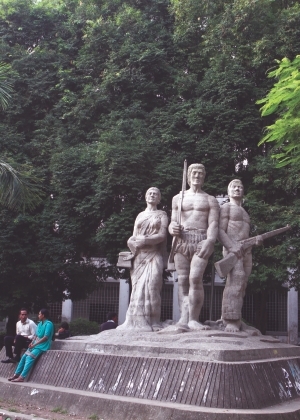 Aparajeyo Bangla, which is in front of the arts and humanities faculty, and other monuments at DU symbolise students' resistance against political oppression. “It was solely for the indomitable spirits of the students that the anti-Ayub agitation could not be suppressed. 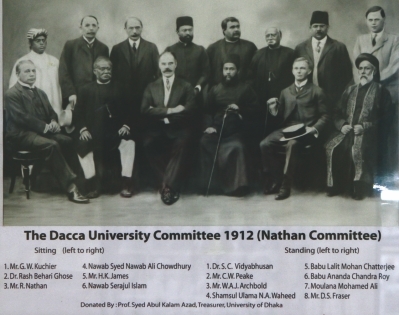 I'm proud to say that the DU students led the student's front in those days. When the Agartala conspiracy trial of Sheikh Mujib began in June 1968, we formed All-Party Students' Association and freed him. 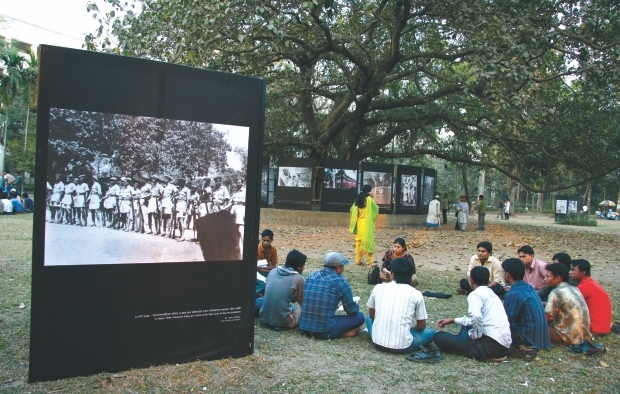 When the Pakistani police gunned down Asad and Matiur in January 1969, all the students' organisations in a combined effort gave such a push that Ayub Khan had to step down,” he says, “The most intriguing thing was that despite ideological differences we the students could work together whenever the country needed us.” That was how Chhatra Union leaders Rashed Khan Menon and Matia Chowdhury; and Chhatra League leaders Tofael Ahmed, ASM Abdur Rab, Shahjahan Siraj and Nure Alam Siddiqui were brought together. 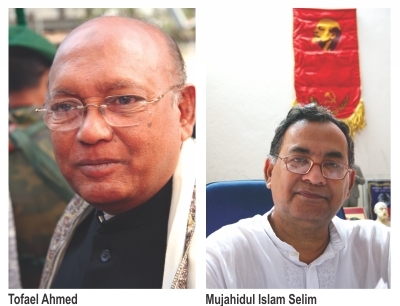 Mujahidul Islam Selim, president of Communist Party of Bangladesh, was the first DUCSU VP from Chhatra Union in the independent Bangladesh in 1972-73. He says, “Now students say they are involved with students' politics clearly indicating that they have to operate under the dictates of national leaders. However, in our times, we used to say that we're involved with students' struggles and movements, and our works were not hampered by national leaders. And what were the struggles for? 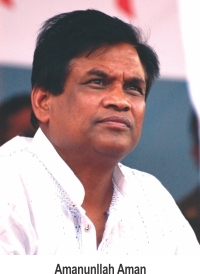 The struggles were first to stand against the discriminatory education policy and then to ensure everyone's access to a progressive education system.” Admitting to the combined effort of student's organisations in the 60s, he however says that Chhatra League and one of its factions deviated from the path of progressive politics after independence. 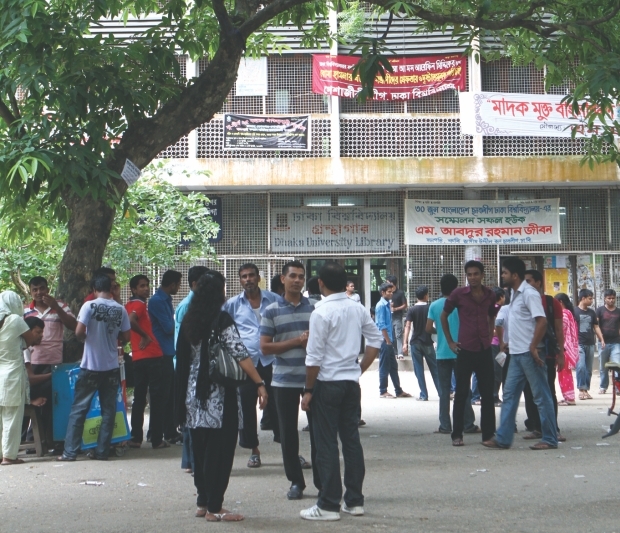 There were two students' bodies in DU during that time: one was Sangram Parishad led by Chhatra league, which included Chhatra Union, Jasod Chhatra League (JSD), Chhatra Moitri; and Sangrami Chhatra Jote led by Chhatra Dal, which included Ganotantrik Chhatra League and Biplobi Chhatra Moitri. At the expense of so many fresh lives, democracy was restored in December 1990. However, what constitutes the most ironic episode of this restoration in DU is the fact that with the advent of democracy the DUCSU was literally made inactive. The DUCSU election has not been held since 1990. It is not only the students' rights, but also a prerequisite for ensuring a healthy cultural life for the students. The absence of an elected DUCSU has also led to dirty politicisation in the dormitories. Many non-residential students and outsiders under the aegis of powerful political leaders occupy seats while residential students are deprived, allege several students requesting anonymity. Worse, sometimes residential students, who have no political affiliation, are compelled to join a procession by student leaders. All the former DUCSU VPs believe that regular elections can put an end to all these undesirable practices and if the DU authorities are serious, they add, the culture of regular elections can be restored. The DU vice-chancellor AAMS Arefin Sidique admits to the utmost importance of DUCSU election and says that a change has begun in the political culture of DU. However, he stresses that without the students' good intentions, this culture cannot be restored (see box below). 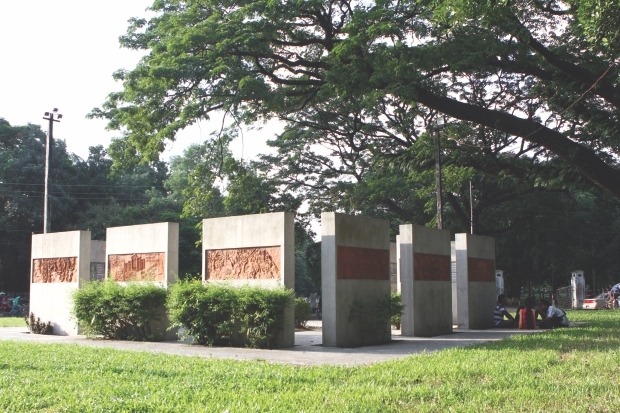 The historic Battala in front of the arts and humanities faculty. The university in its long itinerary has grown to be the biggest educational institution of the country. However, its residential facilities have not grown in proportion to its increasing number of students. According to a rough estimate of the registrar office, in the 2009-10 sessions, there were 19,200 male students with 14 dormitories and 10, 373 female students with only four dormitories. While more than half of the male students remain outside the residential facilities, the female students go through the worst ordeal with less than one third of them enjoying the facility. Even so, the lucky ones for the first two or three years have to share a tiny single bed with another student until she is in the fourth year. 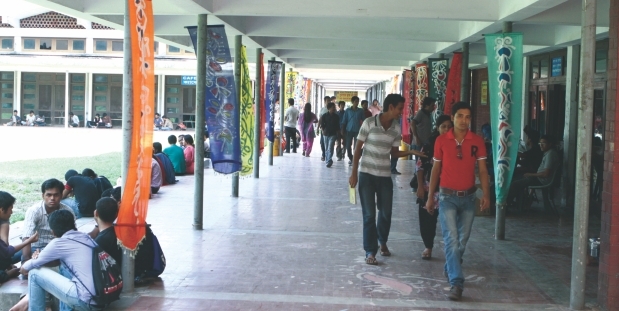 On an average, a four-seat room of Rokeya Hall has at least seven students often causing severe mental crises to the younger students, allege a Rokeya Hall student on condition of anonymity. However, sources from the registrar office say that many problems are created because of session jam. “Students are coming in every year and getting seats while old students of outgoing batches are not leaving because their courses are not completed for session jam. Besides, some politically affiliated and dishonest students also create problems by occupying seats illegally,” says an official of the Registrar office anonymously. Then there is the pivotal issue of quality education which perhaps accounts for DU's poor performance in the world ranking of universities. A growing lack of motivation is also evident in the students. Besides, politicisation in the teachers' recruiting process often employs unqualified students as teachers. Dr Md Yousuf Ali Molla, dean of the science faculty, says that a lack of motivation among students and poor performance of many teachers are responsible for the deterioration of quality education. A dearth of quality research lies behind all these because good research not only boosts performance in world rankings, but also facilitates quality education. 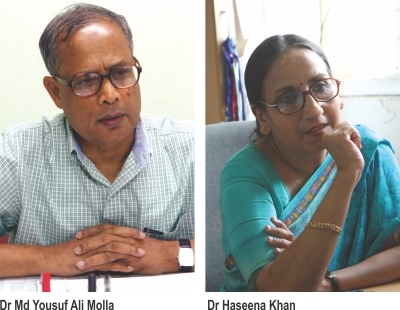 Dr Haseena Khan of Biochemistry and Molecular Biology, who headed one of the units in the research led by Dr Maqsudul Alam that discovered the genetic code of the jute genome, says that the importance of research is always undermined in our country. “Whenever we talk about DU, we emphasise its political role and the glorious, political past but we never say that DU has made its mark internationally not for politics, but for its scientific researches. We have so many meritorious students who are now competing internationally. Because we cannot create opportunities for them, they are leaving this country and not coming back,” laments Dr Khan. The Vice Chancellor Arefin Siddique holds the inadequacy of the budget responsible for many of its problems. Still, he is optimistic about continuing the glorious legacy of DU. “The inadequate budget holds back infra-structural development and other progresses. Despite all limitations, I firmly believe that the devoted, meritorious students of DU will keep up its glorious legacy and uphold the country's image to the whole world,” he says.